Sergei Pavlovich Diaghilev (/diˈæɡɪlɛf/; Russian: Серге́й Па́влович Дя́гилев, IPA: [sʲɪˈrɡʲej ˈpavɫovʲɪtɕ ˈdʲæɡʲɪlʲɪf]; 31 March [O.S. 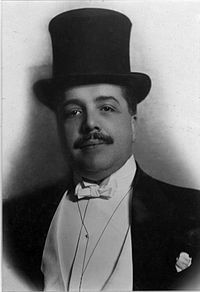 19 March] 1872 – 19 August 1929), usually referred to outside Russia as Serge Diaghilev, was a Russian art critic, patron, ballet impresario and founder of the Ballets Russes, from which many famous dancers and choreographers would arise. Sergei Diaghilev was born to a wealthy and cultured family in Selishchi (Novgorod Governorate), Russia; his father, Pavel Pavlovich, was a cavalry colonel, but the family's money came mainly from vodka distilleries. After the death of Sergei's mother, his father married Elena Valerianovna Panaeva, an artistic young woman who was on very affectionate terms with her stepson and was a strong influence on him. The family lived in Perm but had an apartment in Saint Petersburg and a country estate in Bikbarda (near Perm). In 1890, Sergei's parents went bankrupt, having for a long time lived beyond their means, and from that time Sergei (who had a small income inherited from his mother) had to support the family. After graduating from Perm gymnasium in 1890, he went to the capital to study law at St. Petersburg University, but ended up also taking classes at the St. Petersburg Conservatory of Music, where he studied singing and music (a love of which he had picked up from his stepmother). After graduating in 1892 he abandoned his dreams of composition (his professor, Nikolai Rimsky-Korsakov, told him he had no talent for music). During his years at University, Diaghilev's cousin Dmitry Filosofov introduced him to a circle of art-loving friends who called themselves The Nevsky Pickwickians. They included Alexandre Benois, Walter Nouvel, Konstantin Somov, and Léon Bakst. Although not instantly received into the group, Diaghilev was aided by Benois in developing his knowledge of Russian and Western art. In two years, he had voraciously absorbed this new obsession (even travelling abroad to further his studies) and came to be respected as one of the most learned of the group. With financial backing from Savva Mamontov (the director of the Russian Private Opera Company) and Princess Maria Tenisheva, the group founded the journal Mir iskusstva (World of Art). In 1899, Diaghilev became special assistant to Prince Sergei Mikhaylovich Volkonsky, who had recently taken over directorship of all Imperial theaters. Diaghilev was soon responsible for the production of the Annual of the Imperial Theaters in 1900, and promptly offered assignments to his close friends: Léon Bakst would design costumes for the French play Le Coeur de la Marquise, while Benois was given the opportunity to produce Alexander Taneyev's opera Cupid's Revenge. In 1900–1901 Volkonsky entrusted Diaghilev with the staging of Léo Delibes' ballet Sylvia, a favorite of Benois. The two collaborators concocted an elaborate production plan that startled the established personnel of the Imperial Theatres. After several increasingly antagonistic differences of opinion, Diaghilev in his demonstrative manner refused to go on editing the Annual of the Imperial Theatres and was discharged by Volkonsky in 1901 and left disgraced in the eyes of the nobility. At the same time, some of Diaghilev's researchers hinted at his homosexuality as the main cause for this conflict. However, his homosexuality had been well known long before he was invited into the Imperial Theatres. In 1905 he organized a huge exhibition of Russian portrait painting at the Tauride Palace in St. Petersburg, having travelled widely through Russia for a year discovering many previously unknown masterpieces of Russian portrait art. In the following year he took a major exhibition of Russian art to the Petit Palais in Paris. It was the beginning of a long involvement with France. In 1907 he presented five concerts of Russian music in Paris, and in 1908 mounted a production of Mussorgsky's Boris Godunov, starring Feodor Chaliapin, at the Paris Opéra. This led to an invitation to return the following year with ballet as well as opera, and thus to the launching of his famous Ballets Russes. The company included the best young Russian dancers, among them Anna Pavlova, Adolph Bolm, Vaslav Nijinsky, Tamara Karsavina and Vera Karalli, and their first night on 19 May 1909 was a sensation. During these years Diaghilev's stagings included several compositions by the late Nikolai Rimsky-Korsakov, such as the operas The Maid of Pskov, May Night, and The Golden Cockerel. His balletic adaptation of the orchestral suite Sheherazade, staged in 1910, drew the ire of the composer's widow, Nadezhda Rimskaya-Korsakova, who protested in open letters to Diaghilev published in the periodical Rech. Diaghilev commissioned ballet music from composers such as Nikolai Tcherepnin (Narcisse et Echo, 1911), Claude Debussy (Jeux, 1913), Maurice Ravel (Daphnis et Chloé, 1912), Erik Satie (Parade, 1917), Manuel de Falla (El Sombrero de Tres Picos, 1917), Richard Strauss (Josephslegende, 1914), Sergei Prokofiev (Ala and Lolli, 1915, rejected by Diaghilev and turned into the Scythian Suite; Chout, 1915 revised 1920; Le pas d'acier, 1926; and The Prodigal Son, 1929); Ottorino Respighi (La Boutique fantasque, 1919); Francis Poulenc (Les biches, 1923) and others. His choreographer Michel Fokine often adapted the music for ballet. Diaghilev also worked with dancer and ballet master Léonide Massine. The artistic director for the Ballets Russes was Léon Bakst. Together they developed a more complicated form of ballet with show-elements intended to appeal to the general public, rather than solely the aristocracy. The exotic appeal of the Ballets Russes had an effect on Fauvist painters and the nascent Art Deco style. Coco Chanel is said to have stated that "Diaghilev invented Russia for foreigners." [Rhonda K. Garelick]. Perhaps Diaghilev's most notable composer-collaborator, however, was Igor Stravinsky. Diaghilev heard Stravinsky's early orchestral works Fireworks and Scherzo fantastique, and was impressed enough to ask Stravinsky to arrange some pieces by Chopin for the Ballets Russes. In 1910, he commissioned his first score from Stravinsky, The Firebird. Petrushka (1911) and The Rite of Spring (1913) followed shortly afterwards, and the two also worked together on Les noces (1923) and Pulcinella (1920) together with Picasso, who designed the costumes and the set. 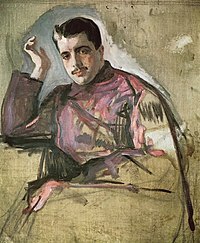 After the Russian Revolution of 1917, Diaghilev stayed abroad. The new Soviet regime, once it became obvious that he could not be lured back, condemned him in perpetuity as an especially insidious example of bourgeois decadence. Soviet art historians wrote him out of the picture for more than 60 years. Diaghilev made Boris Kochno his secretary in 1920 and staged Tchaikovsky's The Sleeping Beauty in London in 1921; it was a production of remarkable magnificence in both settings and costumes but, despite being well received by the public, it was a financial disaster for Diaghilev and Oswald Stoll, the theatre-owner who had backed it. The first cast included the legendary ballerina Olga Spessivtseva and Lubov Egorova in the role of Aurora. Diaghilev insisted on calling the ballet The Sleeping Princess. When asked why, he quipped, "Because I have no beauties!" The later years of the Ballets Russes were often considered too "intellectual", too "stylish" and seldom had the unconditional success of the first few seasons, although younger choreographers like George Balanchine hit their stride with the Ballet Russes. 4 time in the final part of his ballet Daphnis and Chloe (1912), dancers of the Ballets Russes sang Ser-gei-dia-ghi-lev during rehearsals to keep the correct rhythm. Diaghilev's life and the Ballets Russes were inextricably entwined. His most famous lover was Nijinsky. However, according to Serge Lifar, of all Diaghilev's lovers, only Léonide Massine, who replaced Nijinsky, provided him with "so many moments of happiness or anguish." Diaghilev's other lovers included Anton Dolin, Serge Lifar and his secretary and librettist Boris Kochno. Ironically, his last lover, composer and conductor Igor Markevitch later married the daughter of Nijinsky. They even named their son Vaslav. Diaghilev dismissed Nijinsky summarily from the Ballets Russes after the dancer's marriage in 1913. Nijinsky appeared again with the company, but the old relationship between the men was never re-established; moreover, Nijinsky's magic as a dancer was much diminished by incipient madness. Their last meeting was after Nijinsky's mind had given way, and he appeared not to recognise his former lover. Diaghilev was known as a hard, demanding, even frightening taskmaster. Ninette de Valois, no shrinking violet, said she was too afraid to ever look him in the face. George Balanchine said he carried around a cane during rehearsals, and banged it angrily when he was displeased. Other dancers said he would shoot them down with one look, or a cold comment. On the other hand, he was capable of great kindness, and when stranded with his bankrupt company in Spain during the 1914–18 war, gave his last bit of cash to Lydia Sokolova to buy medical care for her daughter. Alicia Markova was very young when she joined the Ballet Russes and would later say that she had called Diaghilev "Sergypops" and he had said he would take care of her like a daughter. Dancers such as Alicia Markova, Tamara Karsavina, Serge Lifar, and Lydia Sokolova remembered Diaghilev fondly, as a stern but kind father-figure who put the needs of his dancers and company above his own. He lived from paycheck to paycheck to finance his company, and though he spent considerable amounts of money on a splendid collection of rare books at the end of his life, many people noticed that his impeccably cut suits had frayed cuffs and trouser-ends. The film The Red Shoes is a thinly disguised dramatization of the Ballet Russes. Throughout his life, Diaghilev was severely afraid of dying in water, and avoided traveling by boat. He died of diabetes in Venice on 19 August 1929, and his tomb is on the nearby island of San Michele, near to the grave of Stravinsky, in the Orthodox section. The Ekstrom Collection of the Diaghilev and Stravinsky Foundation is held by the Department of Theatre and Performance of the Victoria and Albert Museum. Nijinsky, film by Herbert Ross, portrayed by Alan Bates (1980). Anna Pavlova, film by Emil Loteanu; portrayed by Vsevolod Larionov (1983). ^ Joan Acocella, "The Showman," The New Yorker, September 20, 2010, p. 112. ^ Acocella, "The Showman," p. 113. ^ Stephen Walsh. Stravinsky: A Creative Spring. (New York: Alfred A. Knopf, 1999). p. 129. ^ Richard Taruskin, Stravinsky and the Russian Traditions (Oxford University Press, 1996), p. 493. ^ Clive James, Cultural Amnesia (W. W. Norton & Sons, 2007), p. 169. ^ "Who was Sergei Diaghilev? What you need to know about the trailblazer, visionary and ballet pioneer". Telegraph.co. Retrieved 2017-03-31. ^ Wilson, Scott. Resting Places: The Burial Sites of More Than 14,000 Famous Persons, 3d ed. : 2 (Kindle Locations 12127-12128). McFarland & Company, Inc., Publishers. Kindle Edition. Ekstrom Collection: Diaghilev and Stravinsky Foundation is held by the Victoria and Albert Museum Theatre and Performance Department.